(ST. LOUIS, MO, 4/5/2017) – On Friday, April 7, the Missouri chapter of the Council on American-Islamic Relations (CAIR-Missouri) will host “Creativity & Identity, An American Muslim Art Exhibition,” the first St. Louis art exhibition featuring local Muslim artists and performers. WHEN: Friday, April 7, 6-9 p.m. The exhibition will feature several local Muslim artists who will display their art and discuss how art impacts their faith and identity as American Muslims. Various Muslim performers and artists will offer poems, spoken word, Nasheed (religious songs), and comedy performances. International food will be served at the event. Guests will be able to purchase art from the local artists. The exhibition is open to the public and family friendly. 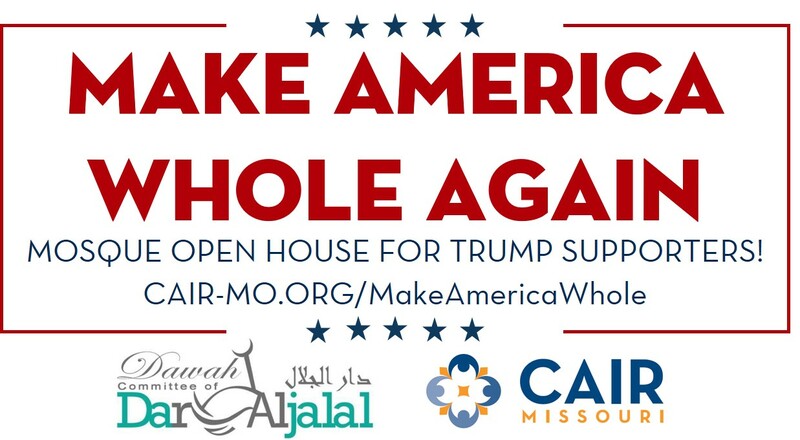 (ST. LOUIS, MO, 3/15/2017) – On Sunday, March 26, the Dar-Al-Jalal Islamic Center and the Missouri chapter of the Council on American-Islamic Relations (CAIR-Missouri) will host a “Make America Whole Again” mosque open house for Trump supporters and Republicans in general. The open house is designed to build bridges of understanding as America becomes increasingly polarized and Islam continues to be misunderstood and maligned. People of all faiths and political beliefs are welcome. WHEN: Sunday, March 26th, 3:30 – 6:30 P.M. The open house will feature guided tours of the Islamic center, including the prayer hall and the school. There will be presentations on “Islam 101,” along with small group discussions. An international dinner will be served. Activity tables at which guests can get henna temporary art tattoos, have their names written in Arabic gifts, Islamic information table, try on and get a photo wearing traditional clothing from around the world, and much more. The event is free, is family friendly and open to the public. Organizers request people register online as space is limited. The St. Louis Muslim community has been active in building bridges with Trump supporters. Last year a group of Muslims attended a Trump rally and passed out doughnuts to all those in line. (SAINT LOUIS, MO, 3/7/2017) - The Missouri Chapter of the Council on American-Islamic Relations (CAIR-MO), a chapter of the largest Muslim civil rights and advocacy organization, will hold a news conference to respond to the signing of President Trump's new "Muslim Ban 2.0" executive order. WHEN: Wednesday, March 8, 11:00 a.m.
"The Trump administration seems committed to undermining the U.S. Constitution by pursuing another Muslim Ban Executive Order," said Faizan Syed Executive Director of CAIR-MO. “This order is not about making Americans safer – which has been debunked by the Department of Homeland Security – it’s about pandering to the Islamophobes that make up Trump’s base and have invaded the administration”. White House adviser Stephen Miller told Fox News that the new Muslim ban will "have the same basic policy outcome." At its news conference, CAIR-MO will discuss "Register Me First" (#RegisterMeFirst) website, produced in partnership with a Los Angeles-based design and technology studio Use All Five, to challenge President Trump's Islamophobic policies, including the Muslim ban and a proposed "Muslim registry." Registermefirst.com will provide an opportunity for anyone who wants to oppose the Muslim ban, any future Muslim registry or other unconstitutional actions by the Trump administration to join the broader movement challenging those unjust policies. Last month, a three-judge panel of the U.S. Court of Appeals for the 9th Circuit upheld a lower court's ruling putting Trump's original Muslim ban on hold. On behalf of the Imam Council of Metropolitan St. Louis (ICMSTL), a council of eighteen Imams that represent the various Islamic Centers and Muslim communities in the Metropolitan area, we would like to express our sincere sadness at this cowardly act of vandalism at the Chesed Shel Emeth Cemetery. We believe this act of hate is not only against the Jewish community but is an attack against all faiths and the values we hold as peoples of faith and Americans. In the Quran, Allah, the God of Abraham says, “And from the followers of Moses are a people who are guided by the Truth, and by it, they are just.” (Qur’an 7:158). We unanimously condemn this act of vandalism as well as the second round of bomb threats targeting Jewish Community Centers across the United States, and all acts of hate against religious groups. The growing antisemitism in our country is both alarming and unacceptable. Sadly, we’ve witnessed the rise of both antisemitism and bigoted actions against several religions in our ever polarized nation. We want every member of the Jewish community to know that we will continue to stand in solidarity and are willing to help however needed. So please reach out to us. Currently, we are encouraging our congregations to help rebuild and repair not only the physical damage but the emotional damages this incident has these caused. Finally, we believe that Allah tests humanity in many ways in order to bring them closer to Him. “Give good tiding to the patient, Who, when disaster strikes them, say, ‘Indeed we belong to God, and indeed to Him we will return’”. We are here to support you and stand with you during these difficult times; as an ally, a friend, and people of the Abrahamic faith. (ST. LOUIS, MO, 2/21/17) – The Missouri chapter of the Council on American-Islamic Relations (CAIR-Missouri) and the Imam Council on Metropolitan St. Louis (ICMSTL) - a body that represents 18 Islamic Centers in the Metropolitan area - today condemned the vandalism targeting a historic Jewish cemetery in University City. The Imam Council will be encouraging Muslim congregations to donate money to help repair damages in the Jewish cemetery. IMCSTL wrote a letter of solidarity to the various Jewish centers in St. Louis. This comes in the wake of a second round of bomb threats against Jewish community centers around the nation. Over President’s Day, at least 10 centers received bomb threats. CAIR’s national office has offered a $5,000 reward for information leading to the arrest and conviction of the person or persons who made these threats. Over 150 tomb stones were vandalized, knocked over or damaged in the incident.